Sony has launched a new digital ultra slim camera in their T series, the Sony DSC T900/S. This ultra slim digital camera comes with dozens of new interactive user friendly features. 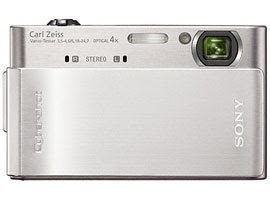 Sony DSC T900 is available in two standard colors silver & black which makes it elegant in looks. This amazing 12.1 Mega Pixel camera has a 4x Optical Zoom and 8x Digital Zoom for close ups. The lens used is Carl Zeiss Vario-Tessar, which provides the users with sharp crisp clear photography. Sony DSC T900 uses BIONZ image processor for its operations. Sony DSC T900 supports features like Optical Zoom while recording movies, Smile shutter, Still photography for portrait images, 14 different types of Scene Selection for enhancing your photo, Auto focus mode for capturing still images, image stabilizer which reduces the shake blur especially for telephoto shots, flash level adjustments, Full HD movie recording facility which allows you to record your memorable moments with an excellent quality and Red eye correction for better adjustment of flash light. Sony DSC T900 comes with an amazing touch display XLCD screen of 3.5 inches (approx. 8.9 cm). The touch screen facility provides the users to easily navigate through the various functions. Sony DSC T900 is powered with a lithium NB-BD1 battery and takes only couple of hours to charge the battery completely. With all these features and functionality, the Sony DSC T900 is no less than a professional digital camera. Experience the joy of professional photography with Sony DSC T900.